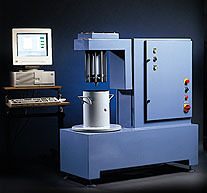 ConTec offers different coaxial cylinder mesuring systems for the ConTec-Viscometer. Each measuring system is designed for a different aggregate size. 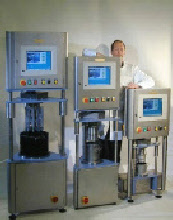 The coaxical cylinder measuring system consists of an outer cylinder, the mix container, an inner cylinder unit and a top-ring. The outer cylinder is mounted on a rotating disk on the instrument where guide-ribs on the disk make sure that it is seated correctly. The inner cylinder wich registers the torsion-moment is lowered into the outer cylinder by a hydrolic system. The inner cylinder is constructed as a two component unit, the bottom unit wich is fixed at the mounting point of the inner cylinder and the upper unit wich is free to rotate against a load cell wich registers the torsion-moment. This arrangement of a rwo unit inner cylinder will virtually eliminate the effect of three dimensinal shearing at the bottom og the inner cylinder and therefore requires no special correction as to the bottom effect. Outer radius can vary, depending on the material tested. Ro/Ri can vary from 1.1 to 1.2 for mortar and paste. Ro/Ri often is 1.3 for SCC (wide gap;WG). Ro/Ri for concrete in the BML normally is 1:45.